An update to the original One X launched earlier this year, the HTC One X+ is a quad-core Android 4.1 smartphone that offers a number of improvements all around plus a slightly refreshed design to keep the One X+ competitive. On the front is a 4.7" 720 x 1280 pixel LCD 2 touchscreen with a Gorilla Glass 2 coating. On the back is an 8 megapixel camera with LED flash and 1080p HD video recording, plus there is a 1.6 megapixel 720p capable camera on the front for video calling. The One X was one of the fastest smartphones on the market, the One X+ boosts the processor speed from 1.5GHz to a 1.7GHz NVIDIA Tegra 3 AP37 CPU with 1GB of RAM, which HTC says is up to 67% faster than the previous version. Internal flash storage has been upgraded to 64GB from 32GB (although there's no microSD slot) and the battery is now a 2100 mAh unit compared to 1800 mAh in the original, which HTC say can power the phone for up to 50% longer. All the expected Android features are here including 3.5G support (but not LTE in the standard model), WiFi, GPS and GLONASS position systems, Bluetooth and the One X+ is also NFC capable. 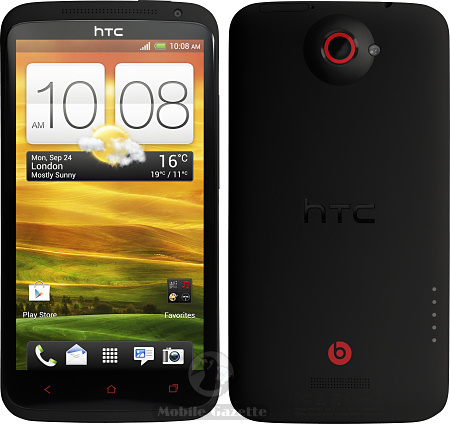 The HTC One X+ measures 134 x 70 x 8.9mm and weighs 135 grams. Shipping with Android 4.1 out of the box, the HTC One X+ eliminates the need to fiddle about with upgrades. HTC also confirm that 4.1 updates will be available for the original One X and the One S "soon". HTC say that improvements have also been made to the camera, and the One X+ also features the well-regarded Beats Audio system. HTC Sense has also been upgraded, and expect to find a number of other enhancements here and there. According to HTC, the One X+ should start shipping in Europe and North Asia during October 2012, South Asia in November and there will be a North American version at some point as well. No guidance was given on price, but we would expect it to retail for around €550 when it hits the shops.